Weekly Pokemon Broadcasting Station #040: "Kasumi's Earnest Struggle! She's Risking Her Life!?" 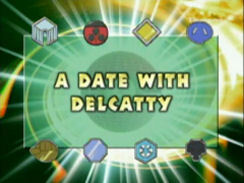 Pokémon Chronicles Episode 11: "A Date with Delcatty"
As Kasumi slaves away at the Hanada City gym, her sisters, who have returned from their world tour, are still shirking their responsibilities at the gym. One day, the Elebuu baseball fan Nanako appears and announces that she's in town to see the Elebuus vs. Starmies game at the Hanada Marine Stadium. As the young trainer reminisces with the Hanada City Gym Leader, Kasumi receives a letter from someone named Tsutomu challenging her to a battle where her life is at stake! Kasumi accepts and heads toward the lighthouse, where she meets a timid boy named Tsutomu. 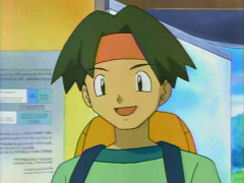 Tsutomu reveals that he wants to go on a date with Kasumi, but the water pokemon trainer declines. Tsutomu doesn't give up and asks if she'll date him if he beats her in a pokemon battle, and Kasumi finally accepts the challenge. 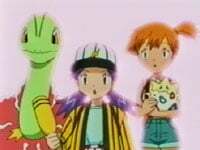 As Kasumi's Sunnygo faces off against Tsutomu's Enekororo, Yamato and Kosaburou from the Rocket-Dan appear to steal Tsutomu's pokemon! Nanako steps up with her Meganium and sends them blasting off again, enabling Kasumi and Tsutomu to continue their battle. The young love struck trainer seems to be winning until Kasumi's pokemon uses Recover, giving it the second wind needed to come out victorious. Then, Nanako steps up and challenges Tsutomu to a battle, putting his baseball tickets at stake. Tsutomu battles with his wounded Enekororo against Nanako's Elekid and wins, but he decides to share the tickets anyway. As the group of trainers leave the lighthouse, Kasumi returns to the Hanada Gym and vows to become the best Gym Leader she can be. So we get a third Kasumi Housou, and...well...it's not my favorite. The battles at the end of the episode aren't particularly entertaining because I really don't give a flying flip whether or not Kasumi dates this little boy, nor do I care whether or not Nanako wins those baseball tickets. And by this point in the series, Yamato and Kosaburou have really degraded into lame Musashi and Kojirou wannabes. I think it's safe to say that the calm, together agents from "The Breeding Center Secret" are dead. The dubbed version treats us not only to horrible voices for the regular characters (Butch and Daisy), but we're also treated to the horrible voice acting of Casey's VA. I mean, I really can't stand the character anyway, and the voice she's given in the dub doesn't help that at all. It's just so obnoxious and earsplitting, and I'm certainly not looking forward to her Housou special later in the series. 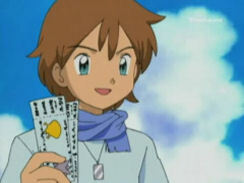 For your reference, this episode was released between episodes AG 040, "Kinsetsu Gym! Tessen's Electric Shock Battle!!" ("Watt's with Wattson") and AG 041, "Kimori's New Technique! The Seed Machine Gun of the Watermelon Field!" ("What You Seed is What You Get"). 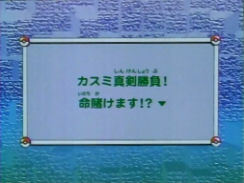 In the Japanese version, Rapurasu ni No'otte is used as the episode's ending theme. Enekororo, Meganium, and Elekid keep their Japanese voices. The only Japanese music in this episode is the title screen music and Nanako's little chant. Everything else is replaced by 4Kids. 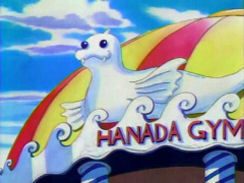 4Kids takes the shot of the Hanada City Gym that shows up before the title screen in the Japanese version of the episode and moves it to the very beginning for the English version. They also do the standard HANADA to CERULEAN paint edit. After that, the shot of Kasumi feeding all the pokemon in the gym (which is originally the first shot of the episode) is shortened by a second. 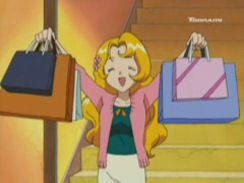 The "text" on Sakura's shopping bag has been erased. 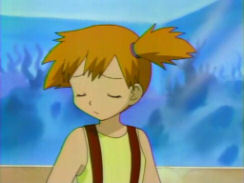 After Misty says "Oh great" (right before the episode's title screen), there's a four-second sequence of Kasumi shaking her head that's removed from the dub. Then we see the shot of the Hanada City Gym, but since 4Kids moved it to the beginning of the episode, they remove it here. The Japanese version used the old Kanto title screen, but the dub uses the Jouto title screen that's been used all this time. I'm not sure why the Japanese producers used the old Kanto screen, but whatever. Cassidy: "We'd like a Hyper Happy Burger combo." Butch: "With a prize in the fries." Cashier: "Right. One Hyper Happy Burger combo with a prize in the fries. Comin' right up." They more or less say the same thing in the Japanese version ("Special Rocket Potato Set"), but their delivery of the lines in the dub is just painful. Especially Butch's, which seems to emphasize 4Kids' lame rhyming scheme. Also, in the Japanese version, Nanba-Hakase explains that he needs Enekororo for "R Project." He doesn't really say what the R Project is, but it's at least it's some sort of motivation for his agents. 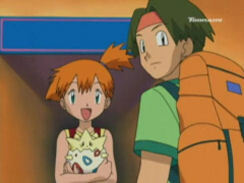 In the dub, the professor doesn't bother telling Butch and Cassidy why they're stealing this pokemon for him. We get a couple of paint edits in a row here. First up is the famous HANADA to CERULEAN edit. Next, the scribbles on the bulletins are erased. ...and the "text" behind Kasumi is erased as well. Click here to view more pictures from these scenes. So you may be looking at the episode's Japanese title and wonder what it's referring to. "She's Risking Her Life!?" How does that make sense as a title for this episode? Well, the letter Kasumi receives is mistaken for a death threat in the original version. The original text is "Toudai ni niji ni koi. Inochi o kakete matsu. -Tsutomu," which translates rather unsatisfactorily as "Come to the lighthouse at two o'clock. I will be waiting to stake your life. -Tsutomu." Later, our heroes learn that "stake your life" is only referring to Kasumi's love life, but at this point in the episode, everyone thinks there's someone out to kill her. The whole "death threat" subplot is done away with in the dub for obvious reasons. The shot of Nanako holding Kasumi's letter is three seconds longer in the Japanese version. Georgio: "Misty, you're the most beautiful girl I've ever seen!" Casey: "You're not the type to fall for that mushy stuff..."
In the Japanese version, Tsutomu's first line asks if there's someone else Kasumi likes. Kasumi blushes, which prompts Nanako to ask the same question. Kasumi says "no" (iya~), and Nanako teases her for it. I think the reason 4Kids changed the dialogue here is because of Kasumi's negative answer to Nanako's and Tsutomu's question. Even though it is a rather unconvincing answer, I get the feeling that 4Kids didn't want to have their beloved Misty denying her love for anyone, since that could then be used as proof that Misty doesn't have the hots for Ash. And we can't have that, now can we? Did I mention how much I despise the whole shipping nonsense that fans obsess themselves over? This one's really hard to see, but the red VS between the picture of Elebuu and Starmie on the tickets (as well as the tiiiiiiiiny VS on the ticket stub) is erased in the dub. Amazingly, all the other non-text is left as-is. 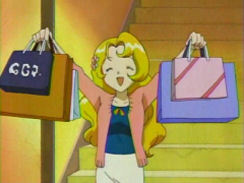 The shot of Enekororo being grabbed by the Rocket-Dan is repeated twice in the dub. It's only played once in the Japanese version. 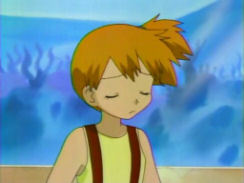 Right after Casey's "Oh boy, Georgio's Delcatty is one tough customer," there's a scene featuring Kenji and Sakura that's removed from the dub. We see Kenji finishing up his duties at the pool before being approached by Sakura, who then tells him about a leak in the pipes downstairs. Kenji says that he'll fix it, saying that he does stuff like this all the time at Orchid-Hakase's lab. 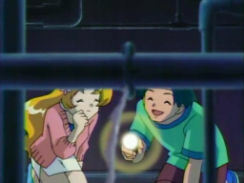 The sequence where Enekororo uses Double Team is repeated in the dub because of the way the commercial breaks are placed. A second is removed from the shot of Kasumi smiling right before the scene switches over to our heroes walking around during dusk. 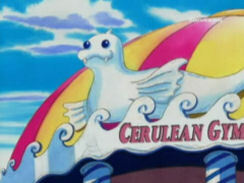 CERULEAN, the text on the blue sign, and the text on the bulletins are all erased again at the end of the episode. 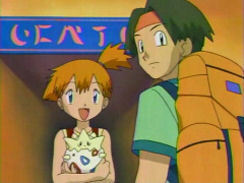 Misty: "Hey, what's the wrench for?" Tracey: "Well, I figured while I was here I'd do a few minor repairs." Daisy: "I'm letting him take me to dinner as a thank-you gift." Aside from the fact that Daisy's line makes no sense (why would he be taking her to dinner as a thank-you gift? ), it's not what's said in the original version at all. Originally, Sakura just comments on how helpful Kenji's been around the gym. Kasumi's final monologue as she sits on the diving board at the end of the episode is more or less the same in both versions. Now there are rumors going around that this is the scene where Kasumi decides to go to Houen to visit Satoshi and his friends (this is the last Housou to air before the Mirage Kingdom episodes of Advanced Generation), but that's not the case, and whoever started that rumor didn't know what they were talking about. Kasumi just talks about becoming a better Gym Leader and nothing else. 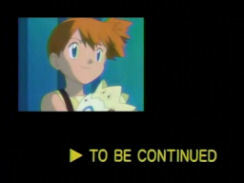 The last part of the episode, where the screen shrinks down and the text TO BE CONTINUED appears, is removed from the dub.